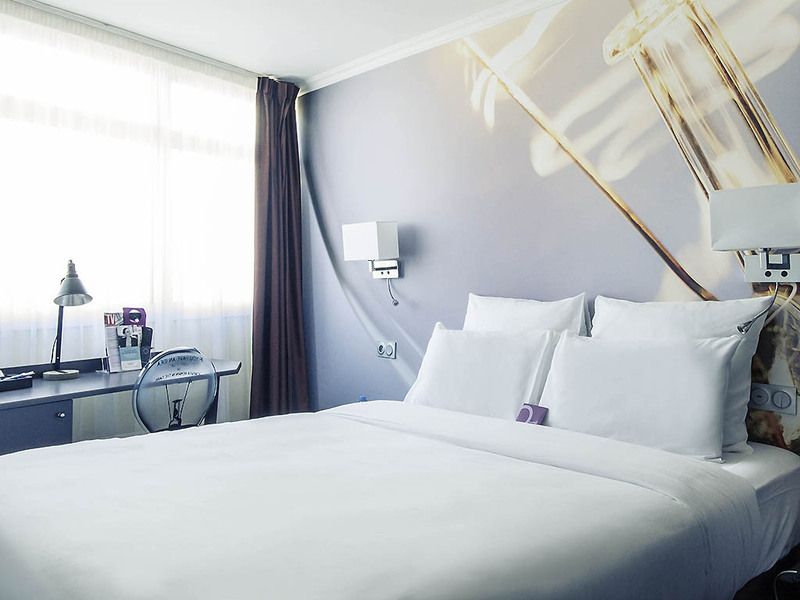 The entire team at the Mercure Paris Malakoff Parc Des Expositions hotel is delighted to welcome you. We are here to help throughout your stay. Ideally located for your business trips or family getaways. Family at the heart of our hotel: 2 for 1 rooms! too old, too noisy, breakfast too poor !! In my room 55: the window opening system was not working well - that was well-known by the reception, but not fixed. The room was too warm and really needed to be air conditioned some way. My room included two safety boxes. Neither of them was working. The main air conditioning channel was really dirty and dusty. The breakfast was the worst I have ever experienced in Mercures. It was too modest and limited. I ate early but already some of the food was gone (e.g. eggs). The hotel really needs to be updated! The reason for my stay was its perfect location next to my work meeting place. I can’t believe how is possible to have 4 stars ....! The door of my room is not working! The Furniture are suitable for hostel not for 4 stars hotel! The staf was ok but everything was a tragedy! The breakfast is good and the room is comfortable. But it is difficult to find the staff who can speak English except the reception staff. Clean, comfortable and very convenient business hotel. Friendly staff. Best if you have business in the area and/or drive. Not for tourists targeting Paris and Parisian attractions. Our stay have been quite disappointing due to bad service. Here is a list of the issues we faced during our stay: 1) Upon our arrival at the hotel, we were asked to pay for an additional 0.46 Euros (due to some taxes), even though I already paid when I booked my room on your site. Why this additional cost was not included in the online price ? 2) I have booked a room for 2 people. However, on our arrival there was only one bathrobe, and only one pair of slippers. When I called the front desk to ask for another bathrobe and pair of slippers, they told me that they did not have any pair of slippers left. Hopefully, the staff was able to provide us another bathrobe though. 3) The envelope of the welcome/quality card, left on our bed, was already open when we arrived. Which does not feel right. 4) On the morning of our checkout, we were not able to use the coffee machine in our room. The machine was serving us only water even though we put a coffee capsule in it. I paid for early checkin at 8:00 AM and arrived at hotel at 8:08 AM. I was made to wait for more than 90 minutes since the room was not ready. Further, I faced this issue despite making an online checkin. The breakfast served at the hotel is a disaster. There was scrambled eggs and sausages available only as hot dishes and nothing else. There was no provision of an egg fry or omlette and not even potato fries or anything else. The selection of beverages and breads were just fine. The disaster was that when it was raining heavily the water was tripping down from the ceiling of restaurant and we were running to find a dry space during the breakfast. Also, after the first day, the access card of my room was not working and everytime the staff needs to come with me to open the door. I am never going to stay with this hotel in Paris and also reconsider the Accor group of hotel because this is my second bad experience within the brand/chain. NOISY ROOM, BATHROOM PAINT COMING OFF, NO HAIR DRYER, TINY ROOM, BAD LIGHTING, BAD RECEPTION STAFF, NO CAR PARK (THE EXISTING CAR PARK IS SO TINY THAT THERE IS NO SPACE TO PARK THERE). The room heating didn’t work. Slept with clothes on. I asked reception if they could fix the heating in my room at 8pm before dinner. Came back and it was still freezing and not working. Had to sleep with clothes on. Terrible. I arrived late in the evening and was put in a converted shed at the end of the garden. Flat roof with rain pounding down. Got wet going to it and to and form a very average breakfast. Location okay and I suppose by Paris standards not a total rip off. I arrived late at night mistakenly thinking that I had a reservation where in fact I did not. I was informed that the hotel was fully booked and nothing could be done. After persisting I was eventually found a room for which I am grateful. Grateful for a room for the night, I did not complain about the conditions and service but I won't be back. The room was what one might expect from a budget hotel, with just enough room to walk around the bed. The sink in the bathroom had dried coffee (I hope) on the edges. The noise of a fan starting and stopping kept me awake even though I switched off the air con in my room. I forgot my razor so asked at reception if they had one I could buy. I had a straight 'No' without hardly looking up from the computer screen. I did note that I could have bought an Eiffel tower key ring though! So to repeat, I'm grateful to the night desk clerk for finding me a room. If had not had put myself in this position however, I would been asking for my 250 euro back as the rest of the experience was very poor. small room but as expected in Paris.